Father’s Day is Sunday, June 18, and we know where you’ll find the perfect gift for dad in Wichita! Whether you dad enjoys gear for the great outdoors or gear for, well, himself, these Wichita retailers offer unique finds you’re not likely to find anywhere else. Find everything from camping tents, shelters and stoves to travel necessities, including coolers, water jugs and grills at Wichita’s Coleman Factory Outlet and Museum. Plus, while you’re shopping for dad, you can browse through the museum featuring more than 100 years of this Wichita-based company’s history. Find your dad the perfect headgear in Wichita’s historic Delano District where Hatman Jack is making and selling specialty hats out of his Hatman Jack’s Wichita Hat Works. Hatman Jack’s is the third largest hat store in the country, stocking nearly every kind of hat – including Fedoras, Stetsons, flat caps and more – and offers custom fitting. 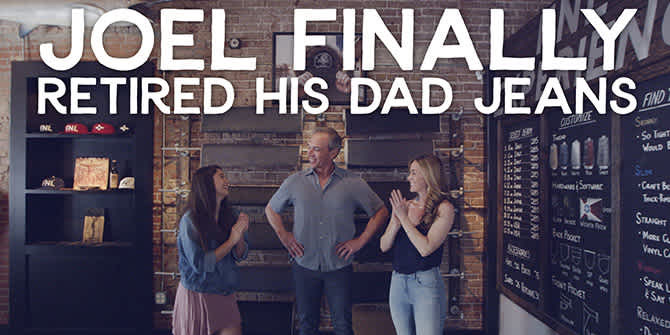 New to Wichita, FNL Denim is a jean company that designs and sews customer-customized jeans so you can finally get dad out of his dad jeans. What dad doesn’t like a day on the green? Wichita has five public golf courses, including Auburn Hills Golf Course – ranked in Golfweek Magazine’s top five municipal golf courses in Kansas – and Flint Hills National Golf Club – former host of the USGA Senior Championship and USGA Women’s Championship. If your dad is an avid golf fan, Wichita has a treat for you this Father’s Day weekend! The PGA Tour and Web.com professional golfers come to Wichita for the 28th annual Air Capital Classic June 15-18 at Crestview Country Club. You can also experiment with a different kind of golf at L.W. Clapp Golf Course where you and dad can play a few rounds of FootGolf – a combination of soccer and golf where players kick soccer balls into a cup in as few shots as possible. Find the golf course fit for your dad. Other Wichita businesses offer dad the chance to take aim and work on a different kind of range. Range54 is not only having a Father’s Day gun sale, but dad also shoots free that Sunday. At Thunderbird Firearms Academy, if you buy $25 in gift cards, you get $5 free for Father’s Day. Both ranges and training academies offer memberships and training so you can get the sharpshooter in your life the perfect gift. The Wichita Wingnuts play the Fargo Moorhead Redhawks 7:05 p.m. June 16 and June 17 and again on Father’s Day at 1:05 p.m. June 18. Catch a game or enjoy the whole series at Wichita’s Lawrence-Dumont Stadium. Is dad a boxing fan? After winning bronze with Team USA in the 2016 Olympics, Olympian and hometown hero Nico Hernandez gets back in the ring for the second fight of his professional career at Rapid Fire June 17 at Harman Arena. What better way to bond with dad this Father’s Day than over a pint of craft beer at one of Wichita’s breweries? Nestled in Wichita’s Douglas Design District, Central Standard Brewing produces a variety of beers, specializing in sour ales and barrel-aged brews. The mix of beers available fits the mix of boards available, too, so enjoy some meat, cheese and beer with dad this Father’s Day. Find other breweries in Wichita. Start Father’s Day weekend right with Donuts (and ART) with Dad. Make crazy pinwheels and cross-stitch ties and bowties with dad – all the while enjoying delicious donuts – 10-11:30 a.m. Saturday, June 17, at CityArts. After breakfast, head out to Benton, Kansas, to enjoy the 10th Annual Fly-In and Car Show at Lloyd Stearman Field. Starting as early as 7 a.m., aircraft will come and go until dusk, and the car show runs 9 a.m.-3 p.m. Free to the public means you save money for lunch at Stearman Field Bar and Grill! Can’t get enough cars? The Sedgwick County Zoo hosts a Father’s Day Car Show 8:30 a.m.-4 p.m. Sunday, June 18. Enjoy classic cars, vintage hot rods and the animals, too! Dads are free with paying child. End your Father’s Day with a sweet treat! The Kansas Aviation Museum hosts a Father’s Day and Ice Cream Social 10 a.m.-5 p.m. Sunday, June 18. Be one of the first 50 families through the door between 1-3 p.m., and get free ice cream! Dads are free with a paying child.